* What is a DIM BOUND and its use? * How do I access it? What is a DIM BOUND and its use? We will have a look at the possibilities of using the ProE option "DIM BOUND". With this option you can set the model dimensions on its tolerance limits and the model will get changed to that limit, without manually modifying the value. Thus, you can have a model, that is on a tolerance limit. This is useful in tolerance stack-up analysis or worst case analysis. For Eg, if you have a dimension "50 (+5 / -2)" and set it to its upper limit using this option and measure the length, you will get 55. But the Dimension Value remains the same as 50 and the model gets modified to its limit value (55). We will have a close look at it now. Edit menu -> Setup -> Dim Bound. With this option, you can set single (or multiple or all) dimension(s) to the following possibilities. Note: if you have not set the tolerance, it will take the default tolerance. A) You can set all the dimensions to any of the four choices. B) You can set a selected list of dimensions to any of the four choices. 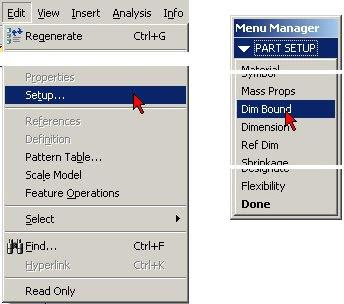 C) You can use "DIM BND TABLE"
Options A and B are pretty straight forward. Select the option - Select one or more dimensions and say OK/Done. Model would have got changed. 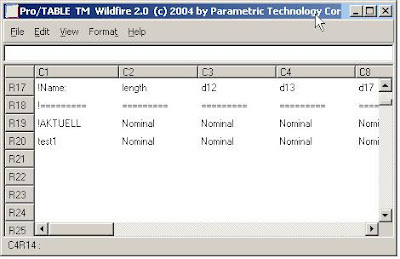 The Option C (DIM BND TABLE) allows you to save, retrieve and edit (in a table) the setting that you want. We will see this later in the post. MMC => Maximum Diameter of shaft and minimum diameter of hole. LMC => Minimum Diameter of shaft and maximum diameter of hole. If the increase in dimension increases the material, then for MMC it should be on UPPER limit and for LMC it should be on its LOWER Limit. vise versa. For "Maximum Material Condition" (MMC) and "Least material Condition" (LMC), you have to set the dim limits manually. ProE, as far as I know, does not have the functionality to automatically identify the dim limits for MMC or LMC condition. Hence what you have to do is to identify yourself the dimensions that are to be set at its UPPER limit and that are to be set on LOWER limits in order to simulate the MMC or LMC. On a simple logic, for an MMC, all external dims should be on UPPER and all internal dims should be on LOWER limits. vice versa for LMC. The "DIM BND TABLE" is very useful if you have to repeat certain tolerance bounded conditions. Assume you have 20 dimensions that you need to set on MMC and LMC. Using Dim Table, you can define the limits of each dimension in a table and you can use that to set the model to a certain state. As you can see there are few options for DIM BND TABLE. * You can save the current configuration with name. * you can Apply a set thats previously saved. * You can go into the table and edit the configuration. In edit mode, you have each dimension as a column and each set as a row. comments are there at the top of the Edit window which is descriptive enough. So don't forget to DIM BOUND the dimension(s) when you need to set the model on its limits. In ProE WF 4, there is a provision to do the statistical tolerance analysis. 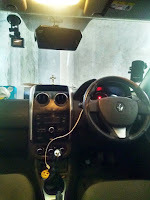 This is achieved by using CETOL of Sigmatrix. CETOL was compatible with ProE earlier as well, but now it can be initiated from Standard ProE menu. But you need a special license for that. How do you find this post. Let me know by comments here or you by rating this posting. I would especially like to see some BMX and/or mechanism tricks. Do you know of a way to vary tolerances based on size?? For example, a screw under 0.5in may have a tolerance of +/- 0.001in but when the length is greater than 0.5in the tolerance shifts to +/- 0.005in. I have some family tables of hardware and would like to capture the varying tolerance information. Sorry that i have missed your query. But you can use tolerance table, if I am not mistaken. It should address this specific issue. I am a Product developer. All these yrs i had been using solid works but now i had to shift to pro e 5.0 so can u pls give me some links or websites where i can get useful basic and advanced help files of pro e?